You probably know the National Association of Photoshop Professionals (NAPP) for their magazine Photoshop User. Well, did you also know that they hold seminars throughout the country on a variety of digital imaging topics? 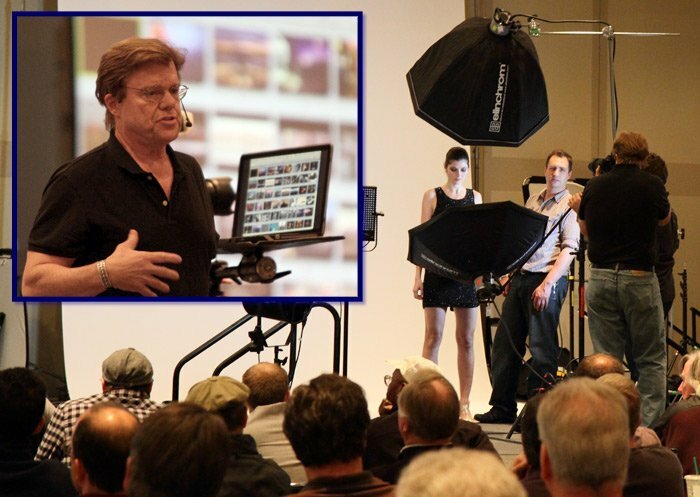 Last week, NAPP held the seminar Location Lighting with Joe McNally in New York City at the Javits Center. This all-day seminar was only $99 (or $79 for NAPP members) and included a printed workbook and CD. Joe McNally is the author of several books and is an accomplished photographer for National Geographic, Life and Sport Illustrated. During the seminar, Joe demonstrated studio lightning techniques using multiple speedlites. He started with one speedlite on a hotshoe and built-up to 6-8 simultaneous off-camera speedlites to recreate professional studio lighting. Joe not only explained each step but demonstrated it, displaying the results of each tweak on large screen monitors. In fact, he did not start working with high-powered studio lights until the last hour of the seminar. Split the location into two zones: foreground lighting and background lighting. Concentrate on main foreground lighting first and “build” the lighting to achieve the desired final effect. Having the camera set to rear-curtain sync will allow you to vary the shutter speed instead of being locked into the flashes default speed. By using speedlites which communicate with the camera, the camera’s TTL will set the proper lighting for the situation. The speedlites will need to face the camera to be sure that they can communicate. By using a softbox (or other on-flash diffuser) behind a large screen diffuser, you can create very natural and flattering shadows. Umbrellas will create soft radiant light. Just by adding a reflector underneath the model, you will create lowlight glamour effects. Be sure the model stands far enough away from the background to prevent shadows on the backdrop. The seminar was not the only benefit of attending. NAPP offered specials on new subscriptions and renewals. Adorama and B&H had special offers for attendees and OnOne Software and Graphics Authority had demoes and specials.